Inequality in the United States will be a key discussion point in the The Great American Divide session at the World Economic Forum's Annual Meeting 2017. Watch it here . State boundaries matter for all sorts of reasons. The state you live in determined how much your vote counted in the 2016 election. It shapes what kind of benefits your employer might offer you, what taxes you pay, what kind of schools you can attend, and much more. Nelson, along with Alasdair Rae of the University of Sheffield, has published new research in the journal PLOS ONE that shows how we might redraw state lines today, if given the opportunity. Their insights have profound implications for how business and political leaders can better organize as a region to work toward policies and projects that help their communities, as well as how Americans should think about the rural-urban divide following the 2016 election. “One of the biggest conclusions from our research is that the familiar division of the U.S. into states isn't always the most useful way of thinking about how geographic patterns work in the twenty-first century,” says Nelson. 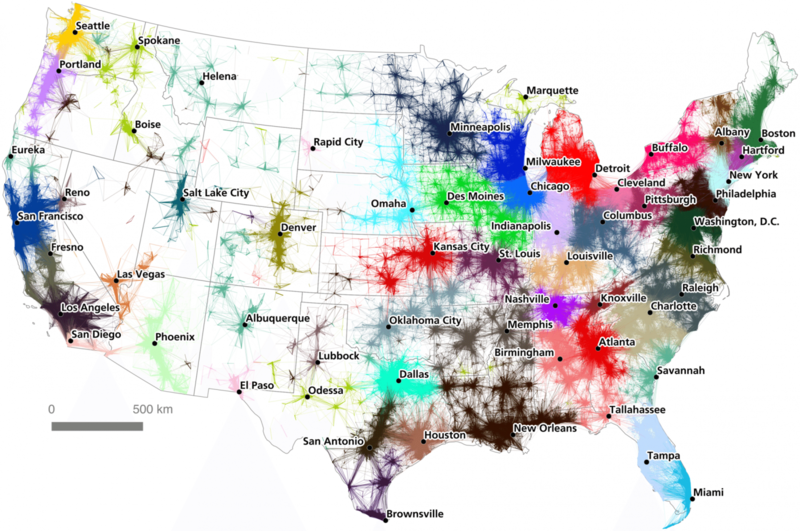 In the study, the researchers used algorithms to analyze data on the commuting paths of more than 4 million Americans from the U.S. Census. They then created maps of what they call economic “mega-regions” — cities, satellite cities, towns and suburbs that are woven together into the communities where Americans live, work and spend their free time. The researchers argue that these, rather than the current states, are the real units that make up the U.S. economy. In the map below, each “mega-region” is labeled with a different color. All have one or more cities at their centers — the blue area is centered around Chicago, for example, while the forest green stretch encompasses Baltimore and Washington, D.C.
To map out these mega-regions, the researchers used the volume of commuter flow between locations as a proxy for the economic connection between two areas. For example, in the map below of the San Francisco Bay area, longer, lower volume commutes are shown in darker shades of red, while shorter journeys are in lighter shades. The map shows that San Francisco, Oakland and Sacramento are all main employment centers, as well as Stockton, Modesto and Santa Rosa. It also shows that commutes and living arrangements broadly connect the area into an economic mega-region. In the resulting map, Toledo gets absorbed into Michigan, while much of Iowa and western Illinois merge. Florida’s panhandle is integrated into Alabama, while Little Rock and Memphis are merged together. The large area covering Montana and parts of Wyoming, Idaho, Nevada and other states is blank because the area is sparsely populated, and the people who commute there don't necessarily gravitate to a single urban area, the researchers say. As a result, the algorithm they used had difficulty recognizing specific mega-regions across that area. The researchers say the maps offer a different perspective on the U.S. than the one many people have adopted since the election. The election gave a picture of a country that is starkly divided into urban and rural areas. Yet these maps show that most parts of the country are actually economically well-integrated, Nelson says. “The reality is that cities, suburbs, exurbs, and rural areas are all extensively connected to one another — not only by commuter traffic, but by all sorts of economic and social connections. While a voter in downtown Boston and a voter in rural Maine might not feel like they have very much in common, our research suggests that they are actually part of an interlocking regional system,” he says. Because the maps offer a clear snapshot of economic linkages, they may also prove to be useful for business leaders and policymakers, the researchers say. They provide far more insight into how a given real estate development, retail business plan or newly constructed train line would affect local economies, compared with the data on metro regions that the Census regularly tracks. 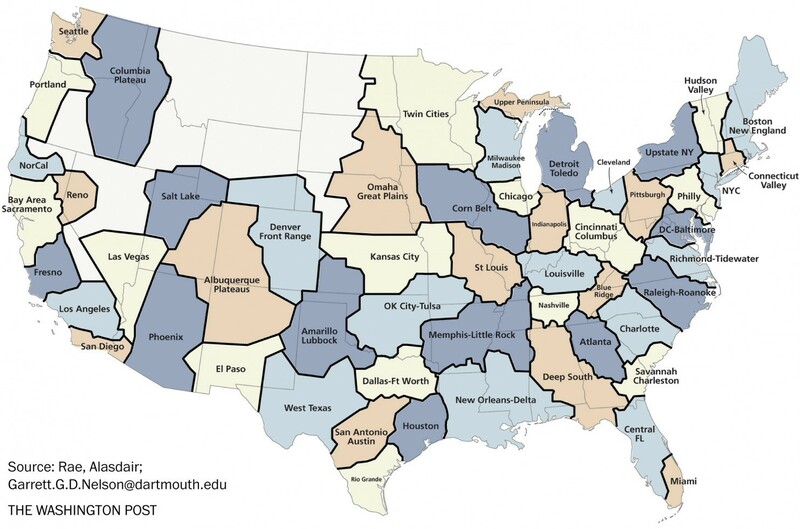 The Brookings Institution, a think tank, and the Regional Plan Association, a research and advocacy organization, have both been pushing for more research into mega-regions. Business and political leaders in some large metro areas have begun thinking about how they can better organize as a region to accomplish their goals. In the Washington area, private sector leaders led by investment banker Russ Ramsey and professional sports owner Ted Leonsis — fresh off a failed attempt to lure the 2024 Olympics to town — are organizing a group to represent the area from Richmond, Va. to Baltimore. That stretch includes more than a dozen universities, four airports and a major port in Baltimore, plus two governors and the D.C. mayor. Instead of intra-regional jurisdictions battling over companies that are already in the area, there ought to be a more collective effort to improve transportation and economic development, organizers say. Often when leaders try to collaborate across jurisdictions, they may be guessing at which communities should be included in a project, and they may confront communities that don't want to be involved, says Nelson. So the researchers hope their data will give regional planners and political leaders the economic evidence they need to recruit the communities that matter into their plans. “This research offers one way of using data to offer a kind of proof that ‘we're in this together,’” Nelson says.